Demonstrating remembrance and patriotism is one way to give gratitude towards fallen soldiers for Memorial Day. Pictured is a scene from this past weekend’s Meigs Memorial Run. 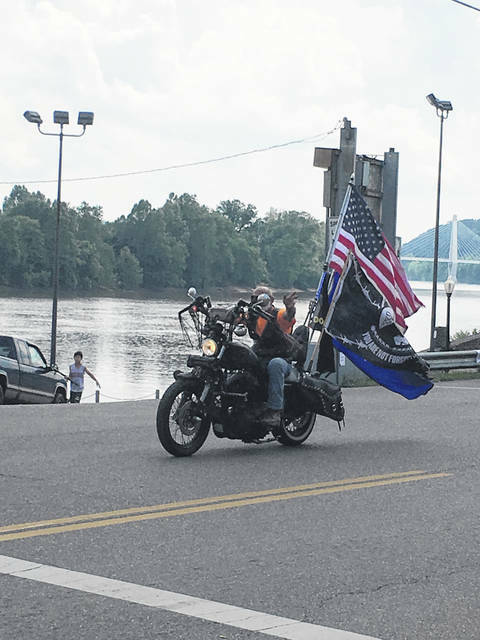 POMEROY — An assortment of many motorcycle clubs and individual motorcyclists made up one entity last weekend for the largest bike run in Southeast Ohio. Not only the participants of the run, but several onlookers packed the Pomeroy parking lot, Main Street, and side streets to take part in the 33rd annual Meigs Memorial Run. The event has turned into a three-day event with activities beginning on the Friday prior to Memorial Day Monday. The event this year had several amenities such as vendors, music, and commemorative t-shirts, patches, buttons, and flags for the motorcycles. Also, a $1,000 prize drawing for a charitable cause. Representatives of the Memorial Run Committee shared the proceeds generated from the various events of the Meigs Memorial Run will be utilized for the underprivileged children and teenagers in Meigs County to provide them with a merry Christmas. The first bike left the Pomeroy parking lot leading the run at 1 p.m. with hundreds of bikes following along behind traveling throughout Meigs County. It was reported from the Memorial Run Committee there were approximately 850 bikes this year. Bikers come each year from all over the country to participate in the run. In addition to being a reunion for family and friends for several of participants of the Memorial Run, the event is also a tourist attraction for Pomeroy with the village allowing a portion of Main Street to be closed off on Sunday to allow the bikers to park along the street as well as in the parking lot. Those who attend the event as riders or as spectators are allowed to walk along and observe the bikes and partake in the events which are held at the Pomeroy parking lot. The run itself began as a tribute to fallen brothers and sisters in the biker community by those “family” members left behind. After all, friends are the family we choose and nobody knows this better than the family of bikers. The original route would travel past the graves of those in the biker community who had been lost. This homage to those who have passed on is the foundation for the run which includes those friends who have become family and of course, blood relatives. More “run” photos appear inside this edition and online at www.mydailysentinel.com. OVP Editor Beth Sergent contributed to this article.